An Ancient Solar System...: Answers for students: What is a light year? 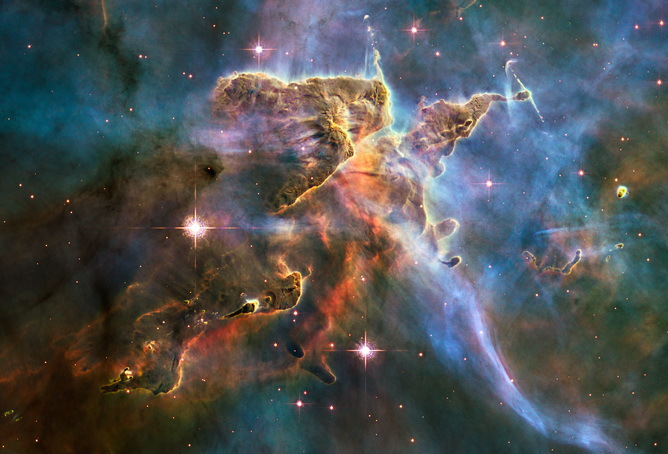 Above: A nebula. The smallest part of this picture you can see in this picture is thousands of times bigger than our whole world - so normal measurements of distance just don't work. Unless you're a linguistic masochist who likes having to saying "billion trillion trillion trillion quadrillion" after everything. This one comes up a lot - It comes up in exam questions, and everyone seems to stumble over it: What are these 'light years' that keep being mentioned by astronomers and sci-fi shows? Do you have to eat less calories, or keep at least one house light on nonstop for 365 days to make them? And the answer is: No. I eat however many calories I like (to be fair I'm starting to get a bit fat and have to go for runs) and I leave all the lights on in my house all the time anyway. A light year is NOT a measure of time. Yes, I know it has the word 'year' in it's name. Yes, that's a pretty dumb and confusing thing to name a measure of distance. No, I can't do anything about it. The important bit is that we understand the dumbness: It's called a 'light-year' because it is how far a beam of light will travel in one year (if it doesn't hit anything). So, to the astronomers that first came up with it, 'light-year' seemed to fit. A beam of light travels at 300,000,000 meters per second. To work out how many meters are in a light year, we just need to work out how many seconds are in a year and multiply that number by 300,000,000 meters. So the number of seconds in a year is 60 x 60 x 24 x 365.25 = 31557600. And, for our grand finale, the number of meters in a light year is 31557600 x 300,000,000 = 9,467,280,000,000,000 meters. Or, in other words, a very, very long way. It's the absurdly big size of the distances out in space that makes astronomers use light years as their units of distance. 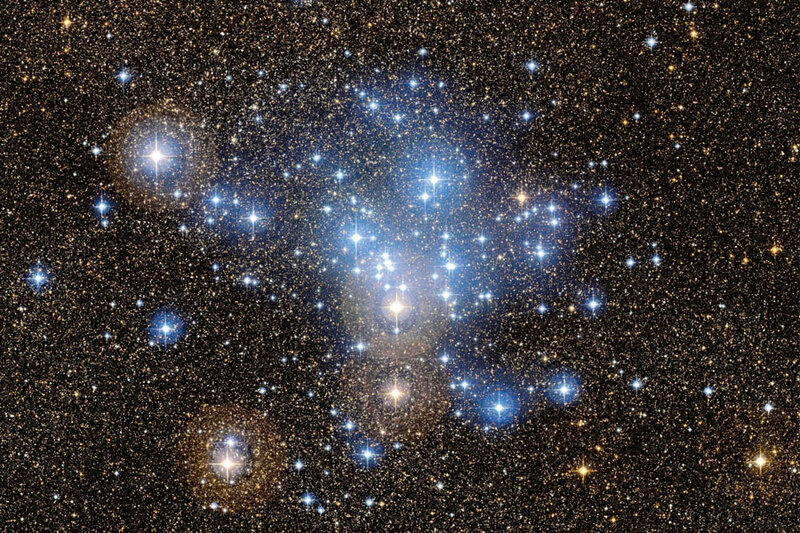 Above: This is the Pleides star cluster, which is 43 light years across. Work that out in meters, using the method above - how many millions of millions of millions is it? And how much longer does it take you to say "Captain the engines cannae take it for another (insert millions of meters)" than "Captain the engines cannae take it for another 43 light years"? Where things get kind of crazy is when you think about what those huge distances mean for how we see the Universe: We see stars with light, which is the fastest thing we've ever discovered. The nearest star to Earth (after the Sun) is four light years away. That means it takes light from it four years to reach us - when you see it in the sky you are seeing it as it was four years back. Most stars are much further away, hundreds or thousands of light-years. Which means that, if you look up at the night sky, you are not seeing those stars as they are today but as they were hundreds or thousands of years ago. When you look at a star you are, very literally, looking hundreds or thousands of years into the past. So... yes Doctor: Time travel is possible - in this limited way at least. A really good example of this is the star Betelgeuse, in the constellation of Orion. Betelgeuse is unstable, and in danger of going supernova. But, because it is 650 light years away, it might already have exploded in a supernova. Right now it could well be a huge cloud of debris. If that had happened anytime over the last 650 years we wouldn't know about it yet, because the light that makes up the image of the explosion wont have reached us yet. When you see Betelgeuse in the sky, you might actually be looking at its ghost. So cut astronomers a bit of slack. Yes they're a bit odd and out of this world. But if your job started at that level of weird (and it gets a lot worse from there, with hairy black holes, lenses made of empty space, and invisible matter that passes through us all the time like ghosts) you'd be a bit odd to by the time you hit retirement. * The 0.25 is because each orbit of Earth around the Sun doesn't quite match a whole number of days, leaving us with a quarter of a day over. For this reason every four years we have a leap year, with an extra day, to compensate and keep the calenders in line with what Earth is actually doing.